There are a lot of link building myths and misconceptions floating around and today we want to clear up some common confusion! When you understand these common myths, you’ll have a ton more success in any link building you do. Just imagine: With the right link building strategy, your website will climb up the results to page 1. Going too slow with link building is a common problem. The real issue isn’t necessarily the slow nature of building links, but with the misalignment of how many links it’s actually going to take to rank on page one. You need to figure out the realistic number of backlinks by analyzing how many links your competitors have that are ranking on page 1. We use ahrefs for competitor research on this. 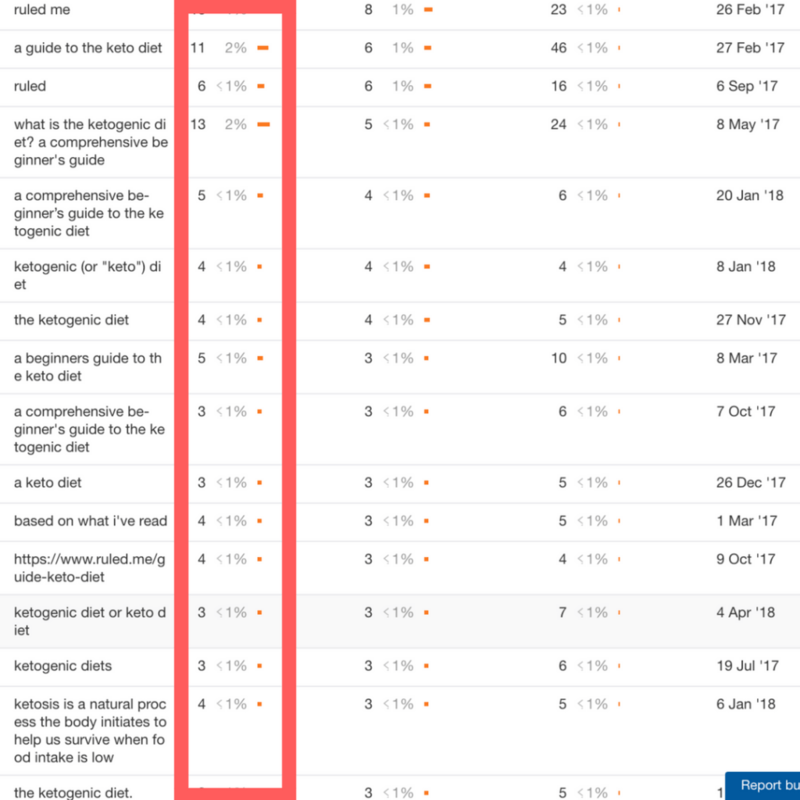 Say you want to rank for “ketogenic coffee” – a keyword that gets about 500 searches a month with a CPC of ~$0.80. Looking at ahrefs, the top ranking results for this keyword have between 76 – 182 backlinks. Since Google is ranking content with this range of links, you’ll most likely need to fall somewhere around this range as well when trying to rank for this keyword. Here’s some scary math: If the average number of backlinks was 100, and you did 1 link/month, you would need 100 months, or over 8 years to rank your content for that keyword. Even if it was a lower number of links, like 12, that means it would take a full year for you to reach that number at 1 link per month. You can get a better picture of how many backlinks on average you’d need to rank by looking at how many links the results on page 1 of Google have. This allows you to set some real goals to follow through on. 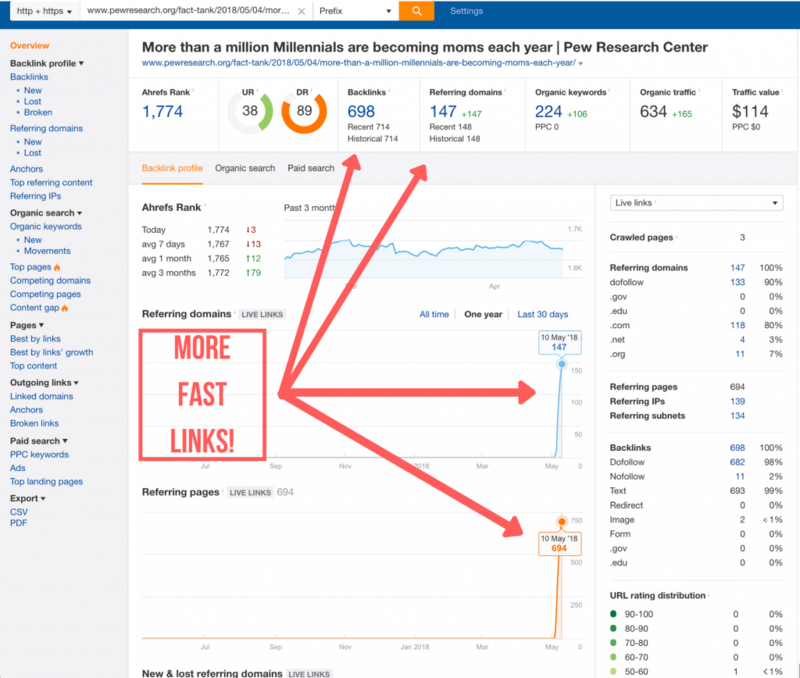 If you want to rank in 3 months: divide the average number of links for results on page 1 by 3 to get a more realistic view of how many links it would take and how much it might cost. When it comes to getting the “right” number of links to your site, looking at your competition’s stats is one of the best ways to get a ballpark figure to shoot for! Side note – as you get up to the top, your position depends on more factors than links alone. If your rankings aren’t improving try these things. The prospect of building links too fast and getting penalized by Google is another common concern. Content that goes viral naturally attracts links quickly. 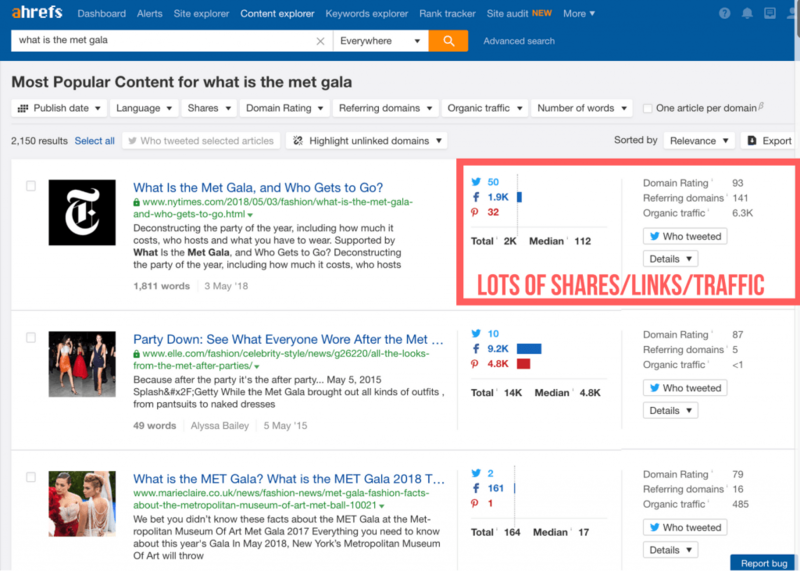 For example, authoritative content that answers a question such as “What is the Met Gala?” naturally attracts a lot of links very quickly because it’s so useful, and in this case timely. This particular article got almost 200 referring domains in just 7 days. This is a common scenario for news content, authority pieces, or viral articles – They attract lots of links very quickly, and not only do they NOT get penalized, they actually rank really well. Other content such as research pieces also generate lots of links because they serve as references for other content to link back to. This research article got nearly 150 referring domains and 700 backlinks in the first week. 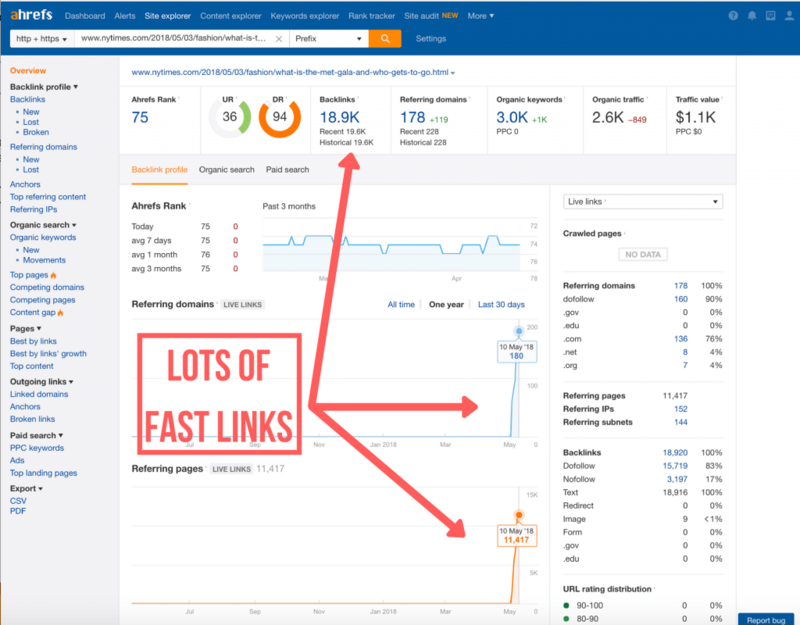 Having fast link velocity isn’t necessarily bad, and in these cases, attracting lots of quality links quickly resulted in some great rankings. There are a lot of misconceptions out there regarding link relevancy. The biggest misconception here is that any link that points to you MUST be from a domain that matches your industry or niche market. 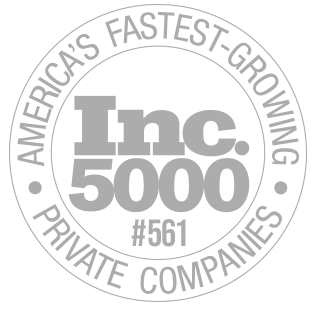 For example, if you are a “swimming pool store,” you should only get links from “swimming pool stores” or very closely related websites. Now, it’s not that you shouldn’t get relevant links, but good link building is more about context. 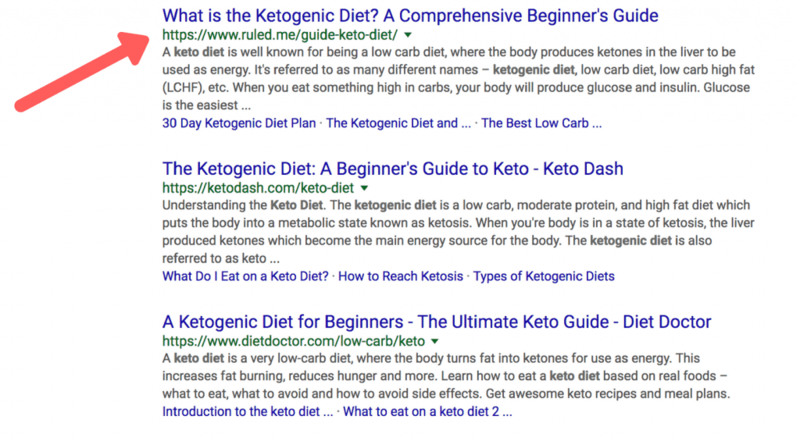 The Ketogenic Diet is all the rage these days – The term “ketogenic diet” get 293K searches per month with a ~$1.00 CPC. This is a very popular and competitive term. Now looking at the results this website (ruled.me) is ranking #1. 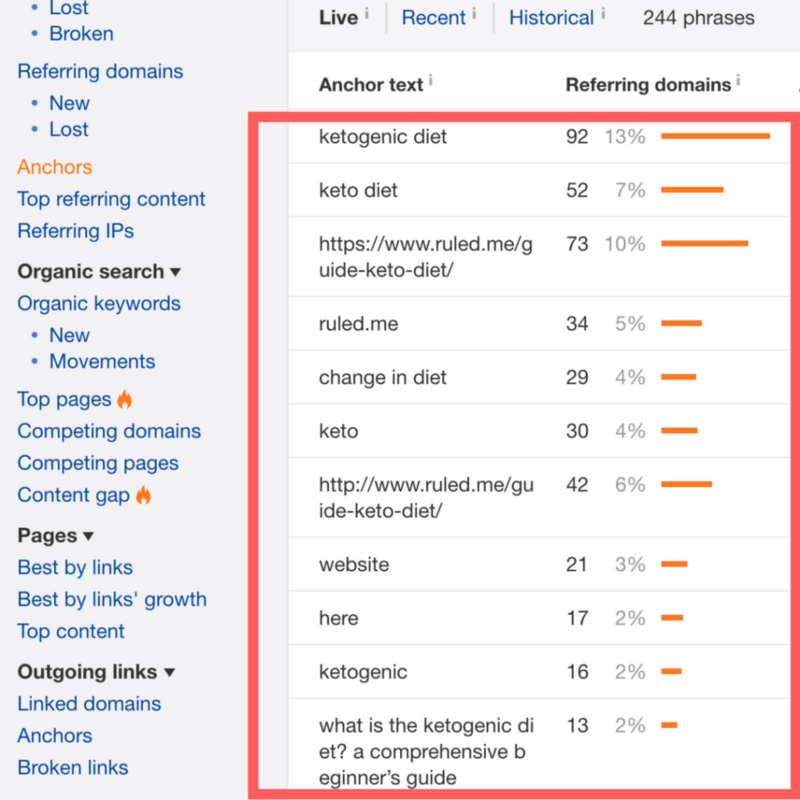 Looking at this site’s backlink profile, you’d think that all of the referring links should also be related to the keto diet, right? As you can see, the top backlinks for this #1 ranking result are pretty diversified. It’s very common to have a diverse set of websites linking to you, but the most important thing to look for is the context of the link. Anchor text makes up a clickable hyperlink [e.g. The HOTH]. Just as you need a diversity of backlink topics, you also want to shoot for a diverse set of anchor text on those sites. In fact, Google attempted to curb the practice of too many exact match anchors with the Penguin update, but we still see this as a common issue with anchor text over-optimization. The approach to take for establishing anchor text is to look at the % of each type of anchor text in the top ranking content you are trying to rank for. You can assume that Google will respond well to those proportions for your backlinks if the topic is similar. Exact match anchors – This is a link that has one of your key phrases in it (e.g. “gluten-free flour”). 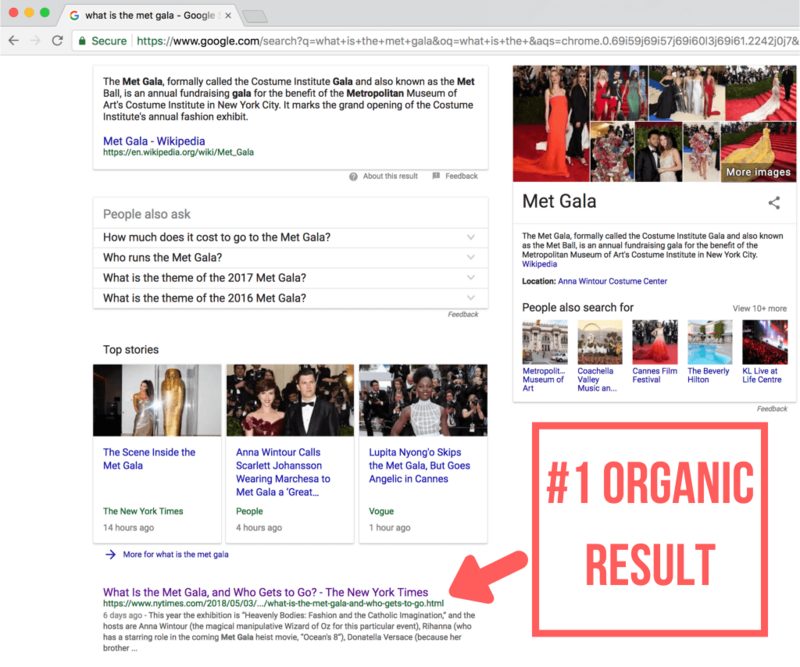 The % of each category shifts according to Google’s algorithm, but you can find some good general guidelines for how to vary your anchor text in this article. Mimicking the backlink profile of your competition is what we call the “sniper approach” to anchor text. Instead of guessing, take a look at the backlinks for the websites Google is ranking on page 1 for your keyword, and look at the proportion of different anchor text categories pointing to them. You can line up your backlink profile with other top-ranked backlink profiles. If you do, you’ll be able to build links rapidly and it will still look natural. I hope that now you have a much more realistic view of building links. By taking a more objective and realistic approach to link building, you’ll be able to make an action plan that WILL meet your ranking goals. Remember: You can find out exactly what you need to do in order to rank by taking the approach in this article. We’ve cleared up the confusion surrounding these link building myths, but there are a lot more myths out there! Feel free to leave a comment below with any other link building myths you might have heard so that we can keep reality in check. 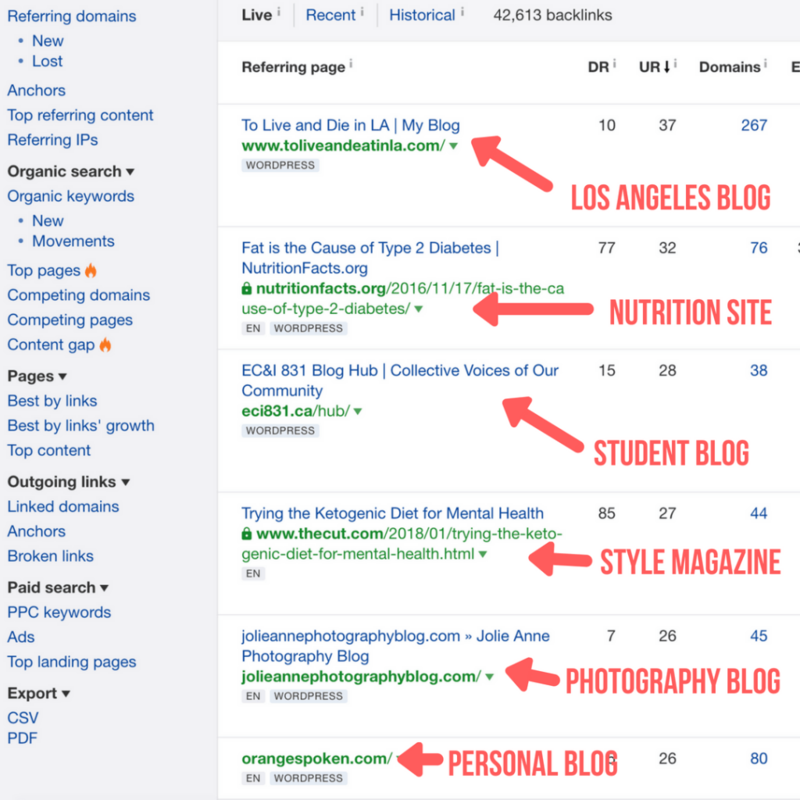 Great article on some link building myths and how to research improvement to our own sites. Keep up the great work and love articles. Thanks for the kinds words, Gary! 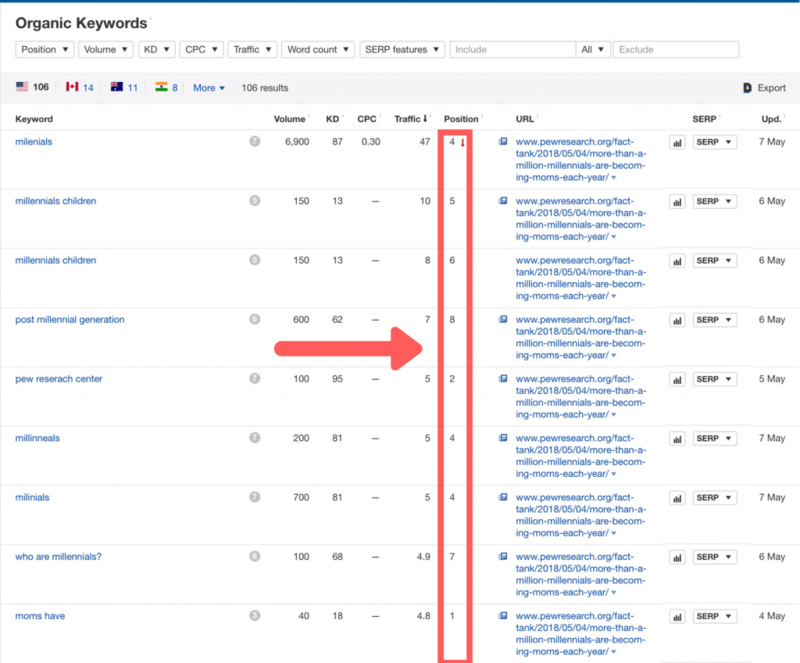 Excellent well written article and very informative that makes a lot of sense, especially breaking down the linking structure of the first page to see how many links you will need to rank on the page for that keyword. A great post! I am struggling to take a site to the #1 for some time, but I didn’t approach still the external link building before, as the competitor has no SEO at all, I thought it would be easy to pass them with only on-page SEO. But i think this post made some points clearer for me and gave me some good ideas to achieve it. Thanks!! Very good article. 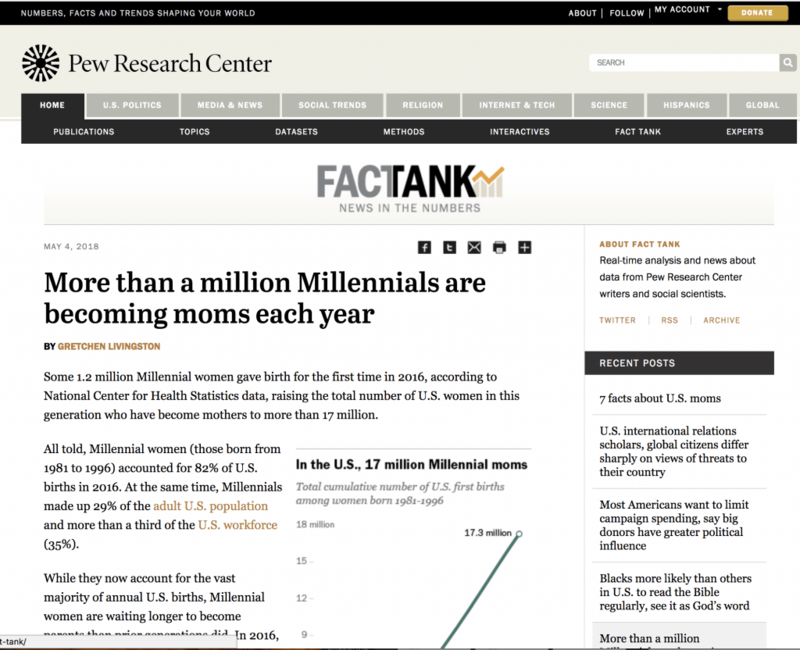 On Myth No 2, the examples you gave are articles that attracted links viraly, and the links are on topic. What about going out aggressively to acquire hundreds of links (whether bought links or free links) that are from relevant niches and irrelevant niches (without context). Won’t there be problem with Google? What is the best tool for checking dofollow backlinks? Great to hear we helped you to clarify those things, thanks! Loved the article! I think the main issue is that anyone starting with SEO expects their website to rank high instantly and that’s not how it goes. It does require a lot of quality and consistent work over a period of a couple of months in order for the ranks to change! Totally agree Nicole! People want instant results when link building takes time to show results 🙂 I think a lot of people just starting out also assume they can just write SEO optimized content and rank it when really, they need those other links pointing to them. I got to know a lot with this article, this one is literary fantastic and I’ll implement all these with my blog as well. Glad you found this post helpful Shivek! This is very useful information, considering my friend is helping me with this and doing absolutely no good LOL. Thank you for the tutorial! If you know any aspiring rappers or hip hop artists, tell them to come to me for beats! Sounds good, and we have a lot more tutorials to increase your SEO knowledge! Well explained. This will be helpful for all. Thanks for the kind words on this article, Nishad! More articles are on the way! Thanks! Judging by the email I receive, a lot of people believe the myth that automated requests for backlinks are effective. Thanks for setting the record straight on these other myths. Very true, Michael. Automated backlinks could get some toxic links in the mix that do more harm than good. Best to go natural and try a variety of different link building tactics. What are your thoughts on paying for backlinks? It depends on what the links are, it can work but only if you’re paying for good backlinks. That’s true, in that case it might be good to get links from health and wellness type websites since most of those include articles on sexual health and aren’t seen as spammy. One of the best Article explaining about how to work on ranking in a good way. In Yoga teacher training keyword. I found people keep on building link without being focused on the niche and within a month tons of artificial links. Never found those sites ranking high and maintaining the ranking. Appreciate the time and efforts to clear doubts of link building. Thanks for sharing your observation. It’s true, you want relevant links from your niche or one not too far removed from it. I have to maintain a restaurant equipment website. I really thought making too many links will send wrong signal to google. But the point of getting viral is the right one. Exactly, too many low quality links is associated with spammy practices, but there is no such thing as “too many” high quality links – you want as many of those as you can get! 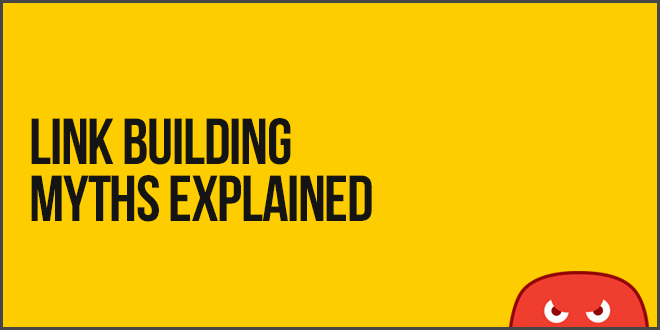 I really appreciate this article, its the smartest way to approach link building, with the simplest high impact of the delivery, i followed all the way to the pot of gold, thats the best way to teach, the facts are sold, looking forward to more tips. Thank You Guys so much, its always confusing and disheartening to see that, lot of people speaking about rights and wrongs of SEO but will never explain why their right is right and their wrong is wrong. I am happy that, here in this article i see some practical examples (Screen Shots-for proof), so that now I can work accordingly. Excellent, happy to help Savan! So in the home based business niche, I thought you had to get links from similar niches. What are other niches can I accept links from? Awesome read this morning. I saw that The HOTH is growing at a good pace. Keep it up guys! Indeed a lot of myths are being circulated around link building. I come from an animation background and I have seen my clients trying hard to build links from related domains. Mix and match is indeed the best way to build an exhaustive link profile. Agreed! Natural backlink profiles are very diverse, and vice versa.